Today I have been married for three years. I can't quite believe it, where did that three years go?? I didn't blog at the time so I don't know if I've told you all the story of our honeymoon. A couple of days before our wedding, some damn volcano in Iceland went and erupted. We got married on the Saturday and were due to fly to Vietman on the Monday, but because of volcanic ash, all flights were grounded. Now, I knew this was a possibility on our wedding day, but I was getting married and really didn't want to think about it. Number one question from our guests? "Ooooh, do you think you'll be able to go on honeymoon or are you going to have to cancel?" Yeah, cheers people. We weren't able to fly, but as we'd booked through a tour company we went in May instead. I couldn't face going back to work 2 days after the wedding when we should have been in Bangkok for a couple of days before heading to Vietnam, so we went on an impromptu roadtrip to North Wales. It was amazing, the weather was incredible and everyone was so kind to us. Funny that, the weather three years ago today was glorious. And this year? Not so much! I've sewn another block for Mabel Figworthy's Fancies Song of the Weather SAL, the Hardanger SAL I've signed up for. I have to apologise for the photos, they're terrible, even by my usual standards. I do believe the blurred patch in the top left corner was a mark on the lens! This is March's block. I enjoyed doing the edge stitch but had to do the first one again. I sewed all four, then looking back I'd improved and the first one was awful, so out it came. I really enjoy doing the cutting and this was no exception. 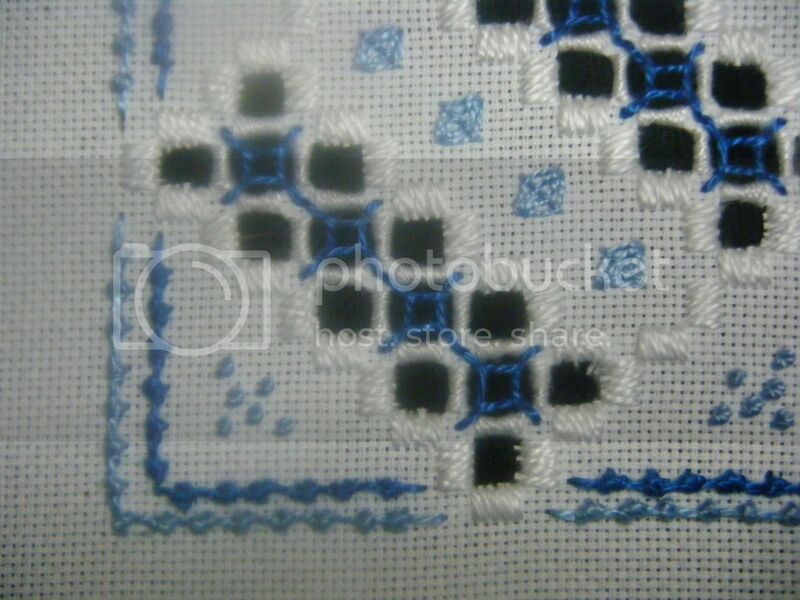 I'm also pretty pleased with the dark blue motifs in the gaps (I've left the pattern in another room and am too lazy to fetch it to check the names of the stitches! ), after some words of advice from the lovely lady who runs the SAL. I've actually completed April too now, I'll show you that later. I can believe it because you're so old. I love the blues and whites of this, very fresh! Happy Anniversary!!!! I remember when that volcano erupted...caused worldwide flight cancelations! Happy anniversary, and clean off the camera lens before you photograph the April block, please, LOL!!! 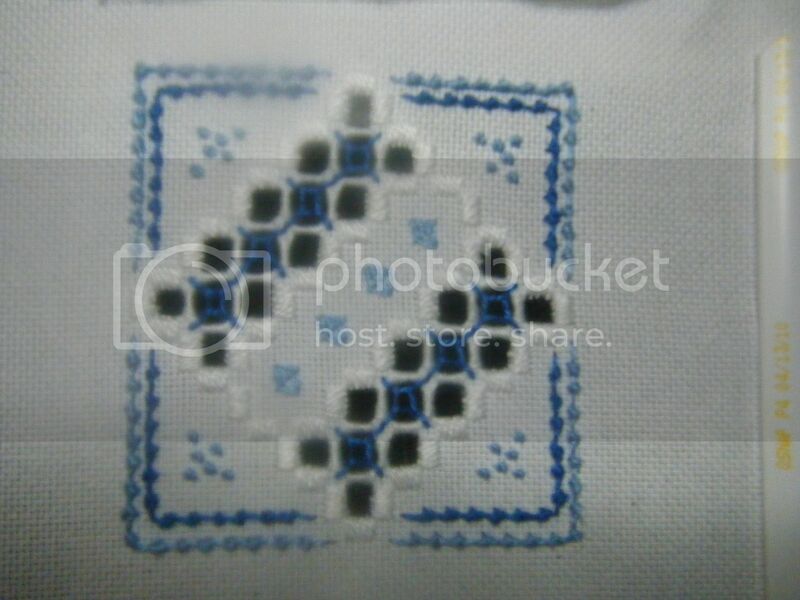 Love the hardanger work, What will you make with the blocks? Happy Anniversary! My brother missed his own 50th birthday party thanks to that cloud! And... welcome to our blog. Happy Anniversary, I remember the flights being grounded, was that really 3 years ago? Happy Anniversary! And yes, the years do fly by... so make sure to enjoy every one. Happy Anniversary and the Hardanger looks great.